Pictured from left are Woodbury Police Chief Tony Burnett, Sgt. Lowell Womack, Arna Smithson and Hank Lloyd. 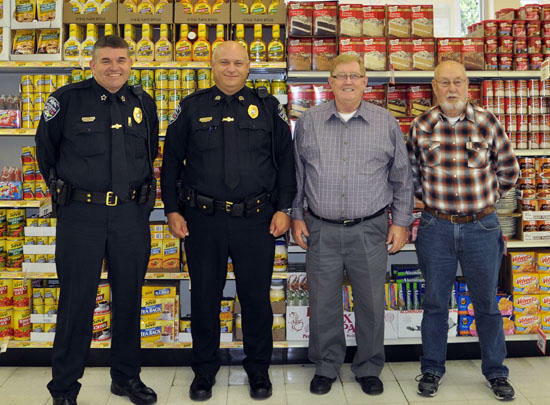 The Neighborhood Watch Program has begun collecting food for the upcoming Neighborhood Watch Piggly Wiggly Christmas Food Drive. Over the last several years the program with the help of citizens and businesses has fed in excess of 100 families per year. Arna and Tina Smithson of Piggly Wiggly have been a huge help with this drive. Each year Arna has contacted vendors for Piggly Wiggly who have donated generously. The program hopes to feed at least 100 families this year. You can make donations of non perishable food items or money at the Woodbury Police Department. The baskets will be given out on Saturday December 17th. If you know of a family who could use help throughout the Christmas holiday please call the Woodbury Police Department and request that their name is put on the list.